With imaginative power and biting satire Swift exposes the madness and folly of learning divorced from morals and of reason devoid of feeling and charity—the cold rationalism of the Enlightenment. In “a Voyage to Lilliput” six-inch creatures, not only tiny in size but also petty and small-minded in thought, possess advanced knowledge of mathematics and technology but lack moral judgment. Their corrupt politics depicts a government ruled by Machiavellian tactics, the mentality of “might makes right,” narrow self-interest, and belligerent war. When Gulliver, the giant called the “Man-Mountain” and a “Colossus” by the little people who marvel at his enormous stature, accidentally arrives on their island, he does not receive the traditional hospitality offered to travelers in need of food and rest. The cunning Lilliputians tie Gulliver, surround him with soldiers with poisoned arrows, transport him with sophisticated machinery, and agree to feed him on the condition that he follows the Emperor’s draconian orders. Gulliver is a useful beast of burden who transports Lilliputians all over the island; he is a powerful instrument of war who can be employed in the country’s naval battles with Blefuscu; and he can perform slave labor by measuring the island with his giant strides. As Swift’s satire of the Lilliputians shows, learning without morality and science without wisdom leads to corrupt politics, the worship of power, the glorification of war, and the use of human beings as objects or instruments of the state. Debating whether to keep Gul liver alive or to put him to death, the Lilliputian mind reduces moral reasoning to political arithmetic: If Gulliver lives, the food he consumes may create famine; if he dies, the carcass may cause pestilence. Thus the Lilliputians decide to blind Gulliver as an act of “mercy” in exchange for his service and labor. As long as they gain more than they lose, the Lilliputians imagine themselves rational, moral, and enlightened. Condescendingly, Gulliver observes, “But, I take this defect among them to have risen from their Ignorance.” He finds the king’s objections trivial, “a nice, unnecessary Scruple, whereof in Europe we can have no Conception.” Imagining himself to be rational, objective, and truthful because of all the data he records in the account of his travels (dates, mileage, wind velocity, latitude, longitude), Gulliver glibly boasts of “an extreme love of Truth” while guilty of the notorious faults of travel writers: bias, vainglory, and relativism. When the little Gulliver who first appeared first to be an insect to a farmer and a doll or toy to the children later attends the court of the king, he swells with boastful conceit as the member of a court, a political advisor who compensates for his diminutive stature by his extraordinary learning and political acumen—an opinion the king dismisses with the view that Gulliver belongs to “the most pernicious Race of little Vermin that Nature ever suffered to crawl upon the Surface of the Earth.” Gulliver’s blind chauvinism robs him of all moral sensibility. Swift’s satire against vain learning continues in “The Voyage to Laputa” where Gulliver encounters a flying or floating island manipulated by a tyrannical ruler who subjugates the towns below with brute power. If they rebel or fail to pay taxes, the king can deprive the population of sunshine and rain, attack them with stones from above, or crush the town by lowering the flying island and demolishing it, “a universal Destruction both of houses and of Men.” Here too knowledge without ethics equals wanton power, and the physics of motion that explains the movements of the island is altogether divorced from its inhuman uses. Swift again satirizes the thinkers or inventors who know how machinery works but never ask why it is needed or what moral purpose it serves. On this island scientists and philosophers, rapt in theoretical, idle speculation require servants or “Flappers” with bladders to strike them on the mouth and ears to rouse them from fantasizing. This kind of thinker is “always so wrapped up in Cogitation, that he is in manifest Danger of falling down every Precipice, and bouncing his Head against every Post.” In the Academy of Lagado the “Projectors” or “Moderns” enamored of progress and innovation erase from their minds the wisdom of the past to pursue research in the form of extracting sunbeams from cucumbers, plowing the land with hogs, and building houses from the roof instead of the ground. While this futile experimentation continues, “the whole Country lies miserably waste, the Houses in Ruins, and the People without Food or Cloathes.” All this useless knowledge lacks human value and moral purpose. The scientific Gulliver who boasted of his great love of truth overlooks the horses’ lack of all human compassion, charity, and tenderness. They do not mourn their dead, and they do not cherish their children, exchanging their offspring with other families. Their imagined reason lacks judgment, discretion, and common sense. A perfunctory reflex, the so-called rationality of the Houyhnhnms is incapable of making distinctions and simplistically views reality exclusively in terms of two categories—the all-good horses and the all-evil Yahoos. 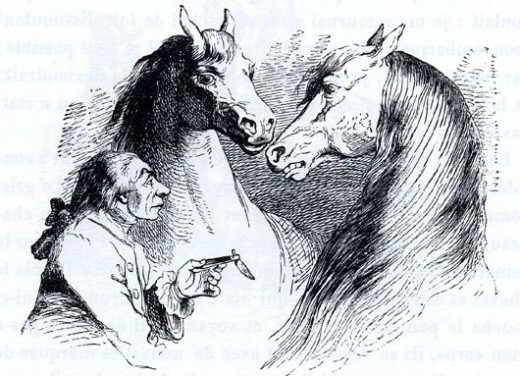 When the horses find themselves perplexed in determining Gulliver’s status (he looks like a Yahoo but he demonstrates the intelligence of a horse), their dull minds cannot acknowledge a third category. The perfect horses that Gulliver idolized as the most rational and benevolent of creatures have no idea of love, and they ostracize Gulliver on the basis of prejudice and narrow-mindedness. Duped by the illusion of the cult of the noble savage, Gulliver’s scientific education blinds him to the reality of good and evil. Ignorant and backward, the horses whose maxim is “Cultivate Reason” reduce thinking to cold rationalism uninformed by the conscience or the heart. In short, while man is famously defined by Aristotle as a “rational animal,” Swift shows the corruption of learning in its many forms during the Enlightenment. The Lilliputians’ profit/loss political arithmetic amounts to the reckoning of a fox or rat. Gulliver’s accumulation of data, statistics, and measurements reduces learning to half-truths and empirical knowledge, numbers without interpretation, tedious explanations of secondary causes with no sense of the final cause. The Projectors’ theories and research that ignore the accumulated wisdom of the past lead to daydreaming and loss of contact with Mother Nature. And the Houyhnhnms’ version of reason lacks all prudence, reflection, judgment, and contemplation. As Swift incisively demonstrates, political thinking, scientific knowledge, and fashionable theories devoid of morality, conscience, and charity are monstrous evils deserving of excoriating satire.